Pros: With a perfectly shaped ergonomic grip and gentle tweezing disc, HP6423 epilator efficiently leaves skin smooth and hair-free. Cons: Frequent use can clog the epilation head, hence cleaning every after use is highly recommended. The HP6423 epilator comes with a seamless design which every woman would love. It has a 24mm flat head made of a high-speed rotating tweezers disc for faster hair removal. Its handle is rounded making it very easy to grip. The slight curvature from its head down to the handle is basically intended to prevent it from slipping while in operation. With a pale white color, the HP6423 epilator is made simply elegant with the gray and brown flower designs embedded at its forefront. The beige switch on its side perfectly adulates its rounded shape. HP6423 epilator has more advanced features perfectly designed for womanly needs. It has two speed settings for optimum experience. Speed 1 features 600 extra gentle pulling actions while Speed 2 features 733 extra efficient pulling actions. Since it comes with 20 gentle tweezing points, your hair removal experience is guaranteed to be safer and faster. This epilator also comes with various attachments for exceptional use such as an Opti smart cap with massage, washable epilation head, and a cleaning brush. The washable epilation head can be removed every after use and can be cleaned with water to keep it clean. The cleaning brush also allows you to clean the epilation head very easily while the shaving head is perfectly shaped to follow the contours of your underarm and bikini line. The HP6423 epilator is packed in a cute white pouch with an extra trimming comb, power cord, and a user manual. What is best about this product is its high durability, which can last up to two years. It is also made with hypoallergenic silver-ion disks to keep skin from itch and rashes. The lady shave is an additional feature that makes it really remarkable. Before epilation, you can use the trimming comb to cut longer hairs and proceed with a more relaxed and less painful epilation. After epilation, you can change its head with the lady shave to fine tune extra hair and smoothen skin even more. Since it is very handy, you can bring it anywhere you go. It buffs self esteem in a way that you do not have to worry that your skin might be rough, especially if you are in an unplanned beaching trip. The convenient pouch will keep your HP6423 epilator safe and well arranged inside your traveling bag. HP6423 epilator is sold at a very friendly price and is often offered with free deliver in many locations. This makes the product a wise choice for people who are saving money from the expensive hair removal services presented in salons. 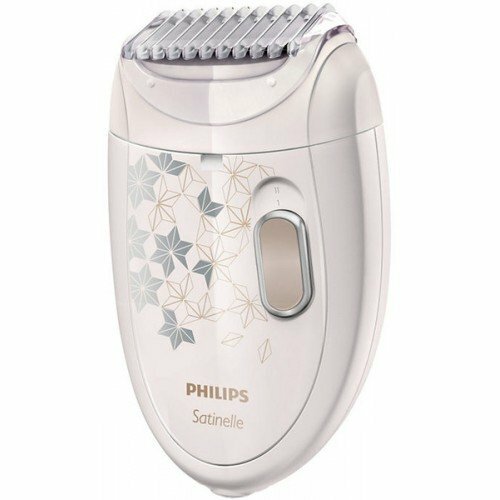 At a very affordable price, one can have a richly moisturized and more radiant skin with the HP6423 epilator. Using HP6423 epilator is a great way to stay comfy with how your skin feels. However, buying the product also comes with certain responsibilities for long lasting use. Since it is very handy, it is extremely advisable to keep the package safe in the pouch every after use to prevent loss. Especially when traveling, the product can easily slip through your mind and get left anywhere. Keeping it in order will also save you from repeatedly purchasing the same product. Another disadvantage is that the HP6423 epilation head can malfunction due to hair clogging. It is best that you brush it from time to time to preserve its functions.